“Absence of evidence isn’t evidence of absence” is a slogan that is popular among scientists and nonscientists alike. This article assesses its truth by using a probabilistic tool, the Law of Likelihood. Qualitative questions (“Is E evidence about H?”) and quantitative questions (“How much evidence does E provide about H?”) are both considered. The article discusses the example of fossil intermediates. If finding a fossil that is phenotypically intermediate between two extant species provides evidence that those species have a common ancestor, does failing to find such a fossil constitute evidence that there was no common ancestor? Or should the failure merely be chalked up to the imperfection of the fossil record? 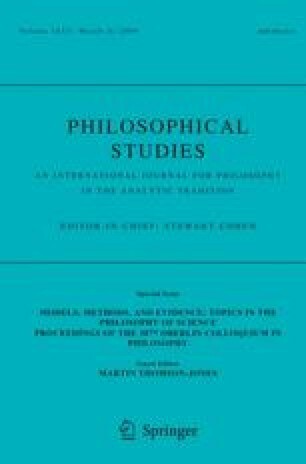 The transitivity of the evidence relation in simple causal chains provides a broader context, which leads to discussion of the fine-tuning argument, the anthropic principle, and observation selection effects. My thanks to Matthew Barker, Bernard Berofsky, Darren Bradley, Juan Comesaña, James Crow, Daniel Hausman, Steven Leeds, Gregory Mougin, Robert Northcott, Gregory Novack, Carolina Sartorio, Yehuda Schnall, Christopher Stephens, Michael Strevens, Martin Thomson-Jones, Michael Titelbaum, Bas Van Fraassen, Peter Vranas, Paul Weirich, Jonathan Weisberg, and Roger White for useful discussion. I am especially grateful to Martin Barrett.